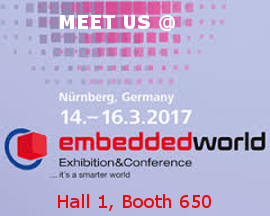 Visit us at the embedded world fair in Nürnberg (Germany) from the 14th to the 16th of March 2017. You will find us in the Hall 1 at the booth 650. The main focus this year will be CAN FD and Powerline Communication. The technology will be presented by the Frischer Electronic, the Yamar and the Explinovo companies as a cooperation. Explinovo will present its CatchTheBus all-rounder ECU.